After 25 years in the field of conflict resolution, I have decided to wind down my practice. If you are looking for conflict resolution training or a mediator, please refer to the links section of this website for the names and contact information for a number of experienced and very capable colleagues. I will continue to offer "The Joy of Teaching Conflict Resolution" to those who want to add activities and exercises to their conflict trainings. 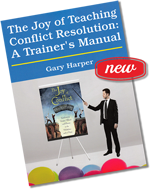 This new book combines two of my passions: conflict resolution and interactive training. I offer it to support you to develop and deliver conflict resolution and related workshops. Click here to read more about my new book, what people are saying about it, and how to order your copy. Order your copy today from New Society Publishers or check out a retail outlet near you. To contact the author or to order bulk copies, click here. The Joy of Conflict Resolution is now available as an e-book through Amazon and Chapters/Indigo. Sign-up here to receive bi-monthly notices of updates to the website. Now in its 3rd printing! All images and content copyright 2003-2016 Harper & Associates.